Wind Turbine (Generator) 12v by Prospect3dlab is licensed under the Creative Commons - Attribution - Non-Commercial - No Derivatives license. Small DC wind generator which i designed myself, for producing electric power for charging phones, radios, LED light etc. 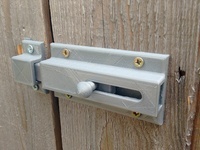 Its designed to be rugged, weatherproof, cheap and reliable. Since i got much suggestions for better, more aerodynamic flin design, i designed new flins, one with hole trough for putting 2mm steel wire trough center for better stiffnes and one without hole. "aerodynamic flin design with hole for wire.STL"
"Housing without gearbox" - if someone wish to make this whole thing without nema17 gearbox, should print only this additional part. Its maked on that way to fit all standard nema 17 motors regardles amperage. SINCE NEMA17 WITHOUT GEARBOX IS HAVING SHAFT OF 5MM, YOU DONT NEED TO BUY 4-5MM SHAFT COUPLER (LOOK AT LINK DOWN IN DESCRIPTION!!! I also recomend 3 winged propeller with this motor, since it doesnt require much wind power and its lighter, but 6 winged will work just fine. Small DC wind generator which i designed myself, for producing electric power for charging phones, radios, LED light etc. On full wind it should produce around 12v 1A, but that vary, according to the strenght of wind. I used Nema17 with 1:5rpm gearbox, but now if i can buy it again, i would go for 1:3.7, it would require much less wind. Its design to be cheap, and still quality maded, to have long life, as long as you follow instructions written here. Nema17 original blueprints are included. Note that you can use pretty much any Nema17 motor, as long as it have front mounting holes on gearbox on 28mm diameter circle (LOOK AT PICTURES OF MOTOR SPECIFICATIONS! ), because its held in enclosure only by thoose 4 screws in front, which means that longitude of motor and gearbox is not critical. You should also need pipe with 36mm inner diameter for mounting this whole system. If you design and print adapter for mounting, take care that it have thick enough walls to endure strong winds. First of all, fair warning: this is maybe not suitable for beginers in 3d printing world, of course i designed it with certain tolerances included so I, myself can assemble it without much sanding, and i included all necessery screenshots which are needed for painless assembly. Some sanding and filing is still needed, as much as treating outer shell of generator enclosure with acetone, so it will impregnate inner layers with molten ABS, for waterproofness. I, personaly used big artistic brush and ordinary acetone, one layer is enough, but it must cover whole surface. This will make generator rainproof. I still maked little hole (2MM) at the bottom of enclosure for drain of any possible rain which could potentially enter, hole is small and well placed, so even rain with wind will not enter. In names of files i included how much pieces you will need. You would need stainless steell stuff, simply because you want it to not rust on rain. Motor shaft hole is having less than 1mm tolerance, for free spinning, but you should put machine grease around it, so it will have even better protection. YOU WILL NEED 3D PRINTER WITH ABILITY TO PRINT AT LEAST 370MM DIAGONALLY, I USED TEVO BLACK WIDOW WHICH IS FAIRLY BIG PRINTER. YOU SHOULD HAVE SOME TECHNICAL/ELECTRONICAL KNOWLEDGE AND EXPIRIENCE BEFORE STARTING TO MAKE THIS! 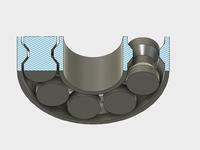 here is shaft coupler i explained, you will need 4-8mm coupler. For any extra questions, feel free to ask, im maybe not best with words, but i will explain and animate as best as i can for better understanding. 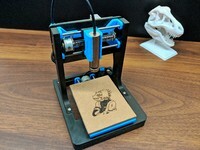 Say thanks by giving Prospect3dlab a tip and help them continue to share amazing Things with the Thingiverse community. Say thanks and help Prospect3dlab continue to share amazing Things with the Thingiverse community. You'll need a PayPal account to tip Prospect3dlab. Click the button below and you will be redirected to PayPal. Once the payment is complete, you'll be brought back to Thingiverse.